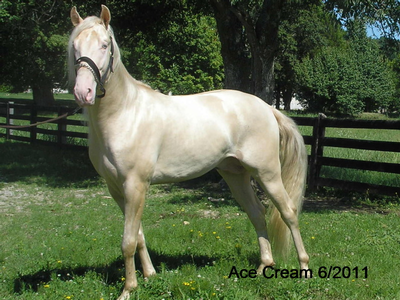 Ace Cream is a beautiful eleven old stallion. He has a wonderful disposition and has passed his wonderful traits to his foals as well as his great four beat gait with lots of stride. We are now in our eighties and have retired from our horse business. This stallion produces golden palominos when bred to chestnut or sorrel mares and has produced buckskins from bays. He has never been ridden but his ground manners are good. Loads, bathes and breeds without problems.